Charlie's Angels premiered as a weekly drama on September 22, 1976. The show was a major hit and all three of the "Angels" were overnight successes. Critics bombarded the show with bad reviews, but the fans stood their ground and made the show a hit. As Sabrina, Kelly, and Jill rounded up the bad guys each week, the characters backgrounds were beginning to develop. 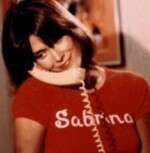 Sabrina was the unofficial leader of the trio and she was thought of as the smart Angel. Sabrina moved around a lot as a child because of her father's military profession. But by traveling so much, she learned several different languages fluently including spanish. We also find out in the first season that Sabrina was married before becoming an Angel, to police detective Bill Duncan. The two are separated but still good friends. The Athletic Angel Jill Munroe became the show's biggest star. Farrah was a phenomenon!! Her hair and her famous swimsuit poster turned her into Hollywood's golden girl. We learn that Jill excels at tennis, swimming, roller skating, skateboarding, etc. She even coaches a kid's basketball team in her spare time. She showed some interest in Charlie in the pilot movie saying that she often lays in bed at night trying to put a face...and body with that mysterious voice. Jaclyn Smith's Kelly Garrett character was the most interesting to me. Early on in the show, Kelly is identified as the tomboy of the group, but as the show progressed it was obvious that her sense of style and fashion could not be ignored. She was the street-wise orphan with covergirl looks. Kelly grew up in orphanges and she ran away at a very early age. Growing up on the street, she became an expert at picking locks, and driving stolen cars. Kelly was the only Angel to have a boyfriend in the first season and she was the sharp shooter of the trio. The first season went very well and the Angels were very interesting individually but as a team, the trio excelled. The first team worked the best together and shared an amazing onscreen chemistry. Everyone was riding the wave of success that the groundbreaking new series was creating until the end of the first season when a shocking announcement was made. America's favorite Angel Farrah decided that she was leaving the show...to be continued.